This summer I’m saying a temporary goodbye to the tiny house, emptying the fridge (and composting toilet), turning off my makeshift water pump and my propane tanks, and generally closing up the house for two months. The great thing about living in a tiny house – all of this will only take a few hours, or less! This is the Adventures piece of Tiny House Adventures, and the main reason I choose to live this lifestyle. It is critical to my happiness and well being to be able to pull up my roots and travel (generally by foot or bike) for months at a time every few years. I’ve been doing it all my life, and I never plan to stop. On July 2nd my new bike and I fly to Calgary, Alberta and take a shuttle to Bamff where I’ll meet up with four other cyclists. We’ll spend a day getting to know each other and re-assembling our bikes before riding off into the mountains early on the morning of the Fourth of July. We’ll head south along the ridge of the Rockies, fluctuating in elevation from about 4,000 feet to over 12,000 feet. Over the last few months I’ve been buying and testing gear and making lists upon lists of things to bring. I want to give a huge shout out to Onion River Sports of Montpelier for being so totally awesome. They do so much for getting central Vermonters set up with biking and skiing equipment, we are lucky to have them. If you haven’t been in, I recommend it. There staff is knowledgeable and helpful, their equipment is top of the line and generally priced appropriately. I went in and told them what bike I wanted and they got it for me. They’ve spent hours standing around talking to me about gear, helping me decide what to bring and what not to bring. Looking at what gear I have and recommending what needs replacing and what is still good to go. All in all, they’ve really hooked me up and I can’t thank them enough. 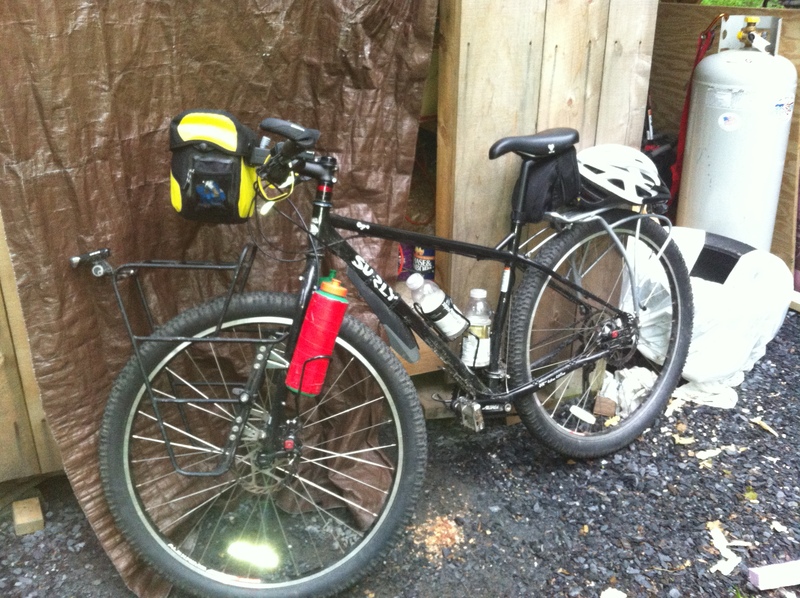 I’ll get a better picture soon, but here it is: My beast of burden! I will give specs elsewhere but the gist is this bike is a machine. It’s a 29er with disk brakes. I’ve got 5 water bottle cages, sturdy front and rear racks, full front and rear panniers, headlight/tail light, odometer, handlebar and seat bags, and more. Over the month or so I’ve had this bike I’ve put on about 200 miles much of which is dirt road or trail and specifically aiming for the steepest climbs. So far I am 100% satisfied with this bike and can’t wait to put it to the real test. I’ll use these pages as my blog and as a way for folks to follow me on this adventure. I’ll be hoping to update it regularly from my phone, so people will have a general idea of where I am and how many miles I’m grinding out each day!